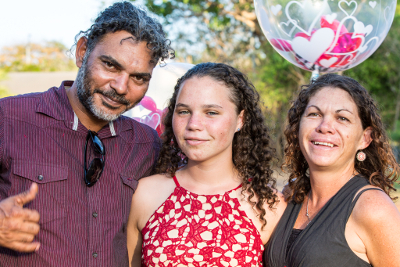 Raychelle McKenzie was just nine years old when she was diagnosed with rheumatic heart disease (RHD). Noeletta, her Mum, originally from Alice Springs, has spent the past four years learning more about the disease and is an outspoken advocate raising awareness around Maningrida in the Northern Territory. Now at 13, Raychelle is four years into her preventative treatment of penicillin injections. The injections keep her from getting acute rheumatic fever again and causing further damage to her heart. Raychelle and Noeletta both understand the importance of getting her injections on time. “She has her needles every 28 days and is very responsible in ensuring they are done on time,” Noeletta tells us. Noeletta’s worked on a number of projects focussing on RHD awareness and advocacy. Most recently, she helped RHDAustralia produce the educational short film Sharing a Heartbeat. She joined a team of Indigenous and non-Indigenous women who came together to develop a culturally appropriate film about love, pregnancy and living with RHD. By bringing her real life experiences with RHD to the film set, Noeletta contributed significantly to the creation of the script and creative direction of the film. Noeletta was also responsible for securing funding for the popular Indigenous Hip Hop Projects music video My Heart Keeps Beating, which was filmed in Maningrida. The music video brought together many people from the community who have RHD and gave them the opportunity to tell their powerful and emotional stories about living with RHD. The video, which features her daughter, starts with Raychelle telling her story “Woke up in the morning and I was dizzy in my head, shaking and sweating in my bed, couldn’t go to school I was short of breath. I went to the clinic to get it checked. Doctor plane flew me straight to Darwin and this is where my treatment started. Rheumatic heart caused all the pain and now I need a needle every 28 days”. Rheumatic heart disease is up to twice as common in women, and tends to affect women during their child bearing years. There is a 30-50% increased cardiac workload in normal pregnancy. Young people aged 5 – 14 years are at highest risk and up to 122 times more likely to contract the disease than non-Indigenous youngsters. Almost all cases of rheumatic fever recorded in the NT between 2005 and 2010 were for Aboriginal and Torres Strait Islander people (98%). It is deemed an entirely preventable disease of poverty. Sharing a Heartbeat is freely available in English and Kriol with plans to make the film available in more Indigenous languages. You can find these films and other important resources on the RHDAustralia resource page. Additional print resources are linked with the English and Kriol films through the resource page on our website. Thanks to Noeletta and Raychelle for sharing their story, we look forward to working with them again in the future.